The Curvelle luxury motor yacht catamaran 33m x9m model is created for absolute comfort and unbeatable performance. Developed by Yachtmarketing together with experienced large catamaran naval architects, Incat Crowther of Sydney, Australia and the highly respected, long-established shipyard Cheoy Lee, known for quality and durability. Curvelle yachts offer excellent value. 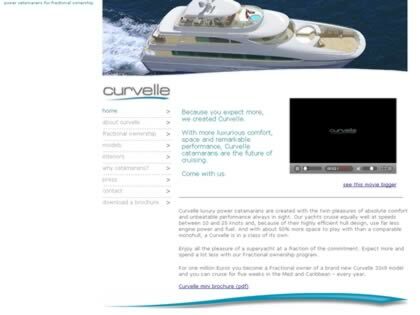 Web Site Snapshot: If available, above is a snapshot of the Curvelle Yachts web site at http://www.curvelle.com as it appeared when this site was added to the directory or last verified. Please Note that Boat Design Net has no involvement with the above web site; all content and images depicted in the above thumbnail are the property and copyright of Curvelle Yachts unless otherwise noted on that site. Description: The Curvelle luxury motor yacht catamaran 33m x9m model is created for absolute comfort and unbeatable performance. Developed by Yachtmarketing together with experienced large catamaran naval architects, Incat Crowther of Sydney, Australia and the highly respected, long-established shipyard Cheoy Lee, known for quality and durability. Curvelle yachts offer excellent value.